The Ravenswood Farmers Market convenes at 4pm and goes through 8 pm every Wednesday through mid-September, located at 4900 N. Damen Ave. in Chicago. It is family friendly with a play lot on the grounds. Only three weeks left to the 2017 South Loop Farmers Market! I can’t believe the summer has flown so fast. In coming weeks, I will be reintroducing the most popular flavors throughout the season and looking ahead to the fall and coming holidays. Here are some of the hits from this season: Maple Walnut, French Almondines, Les Fleurs d’Ete, Cinnamon Swirlies, and Mango Macadamia Nut. Four weeks into the South Loop Farmer’s Market and having fun with it. Thanks going out to all those whose help and support have made it possible, from setting up and bracing against wind and rain, to moral support. 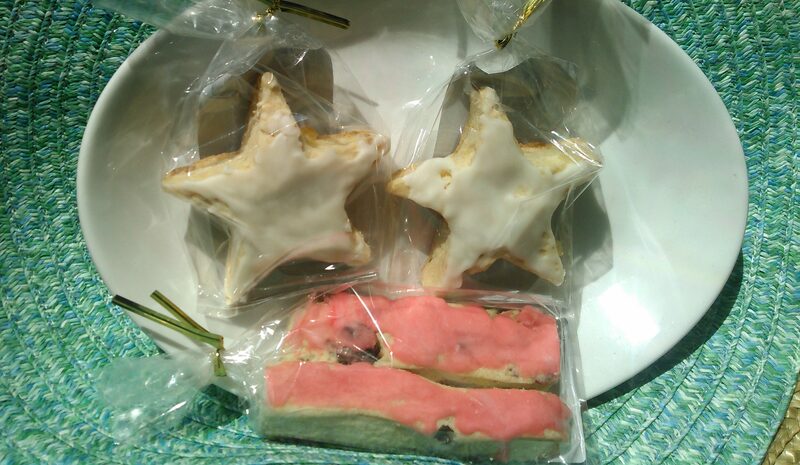 This past week’s Lemon-Ginger Stars and Cherry Berry Stripes were a hit. 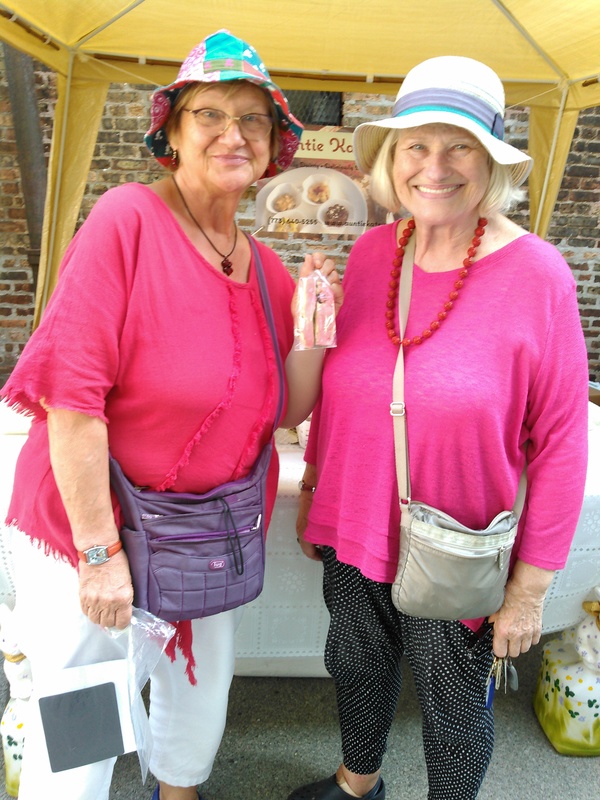 Thanks Janice and LInda for posing with Auntie Kate’s Cherry Berry Sconies! This Thursday, June 15th, 2017 marks the opening of the 2017 Farmer’s Market in Chicago’s South Loop. It will be held in the parking lot of the Presbyterian Church at the intersection of 19th Street and Michigan Ave. Auntie Kate’s Sconies will be among the vendors for the 2017 market. Hours are 4 pm – 8 pm every Thursday. This weeks selections will be Auntie Kate’s Deluxe Lemon Date Pecan Sconies, Deluxe Mocha Almond Sconies, and gluten free Cardamon Ginger Sconies. Once upon a time a precocious cookie and a humble scone met and fell hopelessly in love. They brought into being the perfect complement to a fresh steamy cup of brew. In time they multiplied in number and flavor. Not content to satisfy only the desire for buttery sweet, the loving pair conspired to bring forth a divinely decadent assortment of savory selections that pair well with fermented fare. In the enchanted kingdom of baked goods and bonbons, they were both lauded and loved, each season bringing forth new flavors to delight the senses and expand the realm of culinary joy. This is the fairy tale I’m having so much fun with. In fact, this fecund couple has been so busy through the winter months that there is about to be a veritable sconie boom just in time for the Farmer’s Market Season! It’s hard to believe that 4 months have passed. Test batches… packaging considerations… tasting parties… city regulations… booth design… promo materials… and, yes… storytelling. So much gestation!